The West Coast of the South Island has two outstanding glaciers that come from the highest reaches of the Southern Alps all the way down (almost) to sea level. These are massive areas of snow and ice that are linked by a system of four huts. In winter and spring when the snow piles up and the crevasses are filled, this becomes a ski touring and mountaineering paradise. 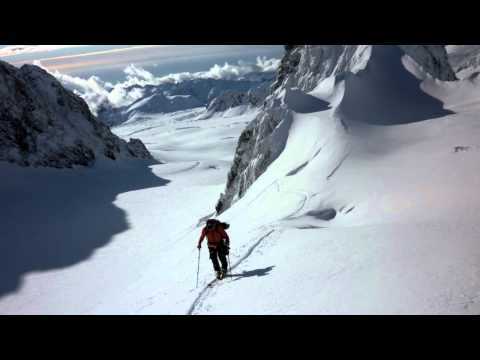 Mountaineering & rope skills applicable to glacier ski & snowboard mountaineering. New Zealand's famous West Coast ski touring and mountaineering. Positive ski mountaineering experience and beautiful glacier environment! Great experienced guide in Dan, super professional, extremely hard working. Food was great and plentiful. There are few places in the world where you can ski on glaciers while looking out over the ocean. This is a unique place and in the world of backcountry touring, the west coast of New Zealand is incomparable. This is the perfect introduction or development of ski mountaineering techniques for the high mountains with a range of peaks and terrain from moderate to steep. Before the trip begins you will receive a complete gear equipment list and we will help you through any questions you might have. We include all the technical gear required for glacier travel (ie., harness, crampons, ice axe) free of charge. All you need is your own ski & board touring equipment. While the West Coast glaciers are our aim, if weather conditions restrict access to this location, not only do we have our weather contingency day bonus, we offer the widest range of alternative backcountry skiing locations, including the Mt Cook, Mt Aspiring regions and locally our Black Peak & Robrosa private huts. This is a HUGE advantage if you are wanting to experience true backcountry rather than being restricted to sidecountry options from ski resorts in bad weather. Are your preferred dates are booked? Don't worry - please contact us and we'll see what we can do. We can also run private trips - inquire about dates and prices. Participants need previous experience with backcountry ski or splitboard touring equipment. You will need to be a intermediate to strong skier/rider with some recent experience in variable off-piste conditions. Due to the remote nature of this trip participants should ideally be using their own ski or splitboarding equipment that they have used previously and are familiar with. If planning on using hired equipment, a warm up day to get used to the equipment and iron out any boot fitting issues is mandatory. Some rock climbing or mountaineering experience is useful. A good level of fitness is required. Participants need to be able to travel up steep hills with ascents of 1000m+ on consecutive days and be strong enough to handle variable conditions. all technical gear required for glacier travel ie., crampons, ice axe, harness etc. Ski or snowboard touring equipment rental not included. It's not a problem if you don't have your own ski or snowboard touring equipment, this can be rented from a local Wanaka outdoor store. How big are the groups on our ski/snowboard tours & courses? How does the Aspiring Guides Weather Contingency work? We usually meet at our office in Wanaka at 8:30 in the morning when we do a final check of your equipment and answer any last minute questions. We drive to Fox Glacier or Mount Cook village where we load the helicopter and have a spectacualr flight into the mountains. Your guide will instruct you on the safety aspects of avalanche and glacier skiing. A chance to explore the area and get a feel on conditions. You will be surrounded by the tallest peaks in New Zealand. Further mountaineering skills will be developed in preparation for bigger objectives later in the week. There are many options for peaks to climb and ski that will be the opportunity to apply the skills that has been covered. A winter ascent of a 3000m peak will be the ultimate objective to put your new skills into practice. Options on the West Coast include Lendenfeld Peak from Pioneer Hut or the twin peaked Minarets from Centennial Hut with its views over the entire length of the Tasman Glacier. On the eastern side it could be Hochstetter Dome, Mt Green, Elie du Beaumont or Mt Hamilton. Ski tour down to a lower hut or pick up. Here the helicopter will pick us up and transport us back down to ground level. NB: Please note that this itinerary is a sample only and the actual itinerary may vary at the discretion of your guide depending on weather, conditions and personal ability.